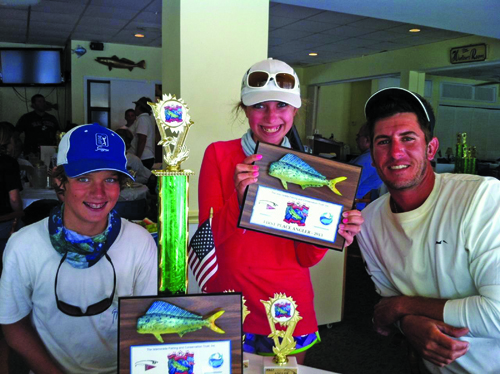 Junior anglers take first place in tournament - The Resident Community News Group, Inc. | The Resident Community News Group, Inc.
Avondale resident Katie Cofran (12) and Quinn Miller (12) of Ortega took first place in the Islamorada Fishing Club Youth Angler Dolphin Tournament on Sunday, July 7. With six-foot seas, fishing conditions were very tough, but they managed to get out and get it done. They fished with Captain Shannon Attales, owner of a 33’ twin hull, the Warbird, out of Robbies Marina in Islamorada, FL. Fishing in a youth tournament, the captain, first mates and dads were not able to touch the angler, rod, reel or line while each young angler were fighting their fish. Once the fish were boat side, the mate could grab the 15’ (maximum length) leader and land the fish. Katie and Quinn (with their dads watching) combined their efforts during a rough day to weigh their 3 largest fish for an aggregate of 39 pounds, beating out second place by two ounces.